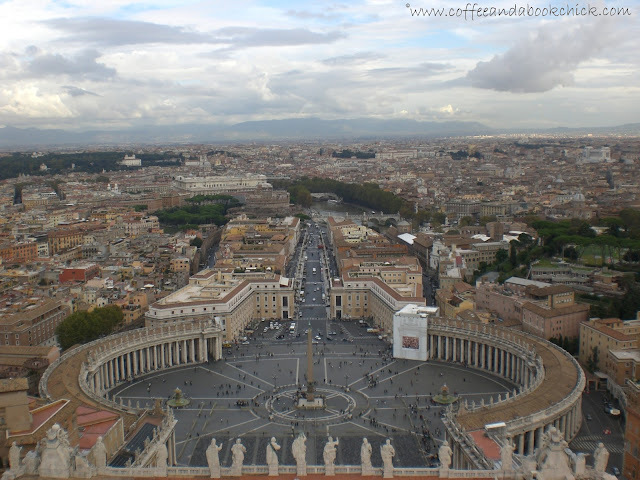 From my honeymoon to Italy two years ago, a shot of the Vatican from the dome on top of St. Peter's Basilica. What I love most about this picture is not just the obelisk at the center and the immensity of the courtyard (is it called that? ), but it is, in fact, the saints. It is those impeccable statues at the top lining the roof, almost keeping watch. For more amazing Saturday Snapshots, please visit Alyce with At Home With Books. For my recent reviews, including the audiobook for Kate Morton's The Distant Hours, click here. I've never been there, so I had no idea that there were statues of saints up there like that. The whole photo is cool, from the statues to the clouds in the sky! Great picture. I've stood right where you did to take this picture, and I remember being blown away at how MASSIVE St. Peter's was. Seeing the Vatican on TV just doesn't give you an appreciation of the scale. I guess that is what they had in mind when they designed the Basilica, right? Very cool photo. The saints look like a procession. What a perfect photo. I've never been to Italy - love the old world charm of Europe. What an impressive photo - it takes in so much! The saints do look like they're standing guard. Awesome photo! Thanks for sharing. I so want to visit there someday! Should that be a requirement for a Catholic? The size of those old structures and courtyards are incredible, aren't they? I've never been to Italy but I've been to Paris so I know what you mean by 'immense'. And all the statues! Wow. You rendered me speechless with this photo!!! Oh, I love Italy. We were there last year for our 25th. Terrific photo. What a lovely view of the Vatican and the city. I love your photos from Italy. I want to go so bad! I love everything about the photo and now I want to go to the Vatican. What a gorgeous view. It looks so different from up high. I only saw it from the ground. And those clouds... they are like a painting. Gorgeous picture! I agree, the saints are the best part! Awesome picture. I have not been there yet. This picture is stunning! Totally worthy of a postcard....and makes me want to go to Italy all the more. Oh my gosh! Those saints are amazing! I love this picture, Natalie, and thank you for sharing it with us! Amazing shot! I knew it was big, but didn't know it was that big. I also didn't know there were statues of Saints. Absolutely gorgeous! I've always dreamed of vacationing in Italy, and this just makes me want to go even more. I love the saints lining the roof. It has a kind of calming effect. Thanks for posting. A wonderful photo. I've never been, but I'd like to go someday. What a wonderful picture. You must have had an incredible honeymoon in Italy! I loved seeing those too when I was there. They were done by Gian Lorenzo Bernini. Fascinating.